Are video games art? If you had asked me the question 5 years ago I would have pointed you in the direction of The Orange Box. It included three games all made using the same engine, all made by the same developer, but with wildly different art styles. The developer commentary (particularly that with Team Fortress 2) suggested that this was no fluke and Valve really knew what they were doing. Later they released Left 4 Dead and, again, despite the same engine and same developers it was very different to the three games in The Orange Box. The developer commentary in the game talked about art direction and how colour and light was used to direct the player where they wanted them to go without adding noticeable boundaries. Back then I would have said that Valve were at the top of their game and that they alone could prove that video games could be art. Each of their games, from the (two very different) post apocalyptic worlds of Half-Life and Left 4 Dead to the clean clinical lines of Portal and the cell shaded alternate 60s of Team Fortress 2, each of them tells a story through the visuals alone, each of the characters can be understood before they even speak just by looking at them. I would have argued that not only can video games be art with these games as my sole evidence, but that Valve had a better understanding of art direction than nearly any (current) Hollywood film director. I first noticed the problem when the hats started arriving in Team Fortress 2. The original developer commentary for Team Fortress 2 talked a lot about silhouetting, the idea that each character should be identifiable from just their silhouette to add in gameplay, it also talked about how the visuals of each character needed to show what that character does. 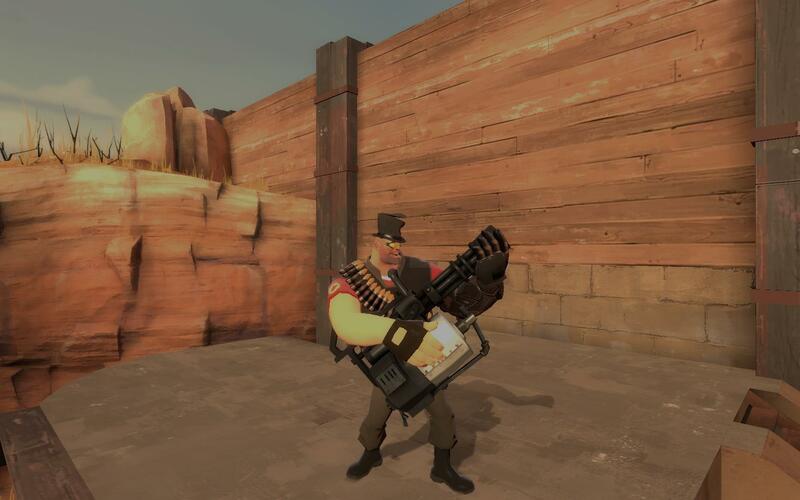 Unlike in other class based shooters where everyone uses pretty much the same model and the only real difference is the weapons they carry (granted some might give the medic a red cross on his arm) Team Fortress 2 was designed so you knew what each class was about just by looking at them. The introduction of hats distracted from that. 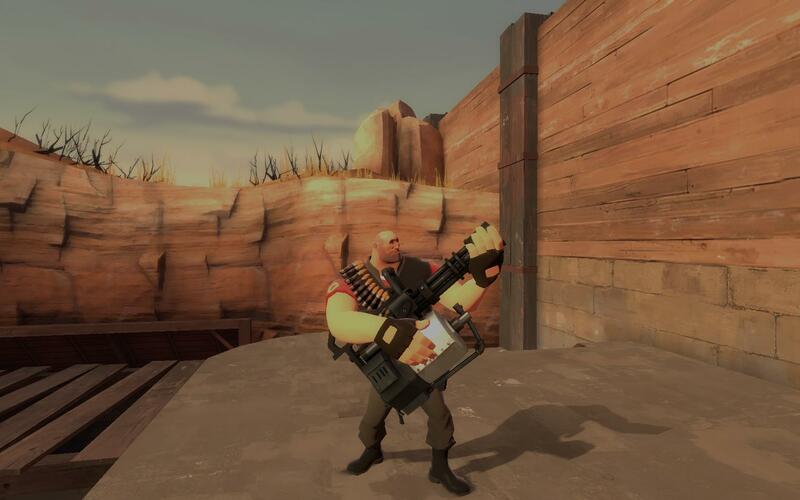 The instantly recognisable Heavy Weapons Guy. Some people will say that the hats don’t change anything, that the classes are still the same basic shape and easily identifiable. Perhaps, but it does stop you identifying what that class is supposed to do. Take the Heavy for example, as this is one of the first places they went wrong. We know the character, a stereotypical eastern bloc big guy, we know from our knowledge of tropes that this chap will be slow but “hard, like iron” and with a liking for huge guns. Then Valve gave him the option of wearing an American football helmet. Not only is an American Football helmet not suited to combat, making it ridiculously at odds with the art direction of the rest of the game, but what is the stereotype of an American football player? It sure isn’t the same as that of a large eastern bloc mercenary and I doubt they have the same fondness for oversized weaponry. Top-hat, shades and a bionic arm, does that arm do anything? Who could know? As more and more hats were added, each more at odds with the theme of the game than the last, most of what I loved about the game was taken away. Yes Team Fortress was always cartoony and always quirky, but it had direction and was never stupid, it always made sense if only within its own internal logic. These days that has been lost and in its place we have a bloated mess, a joke covering what used to be beautiful art, a moustache on the Mona Lisa. Sadly, worse was still to come. Not content with the badly thought out items that were, however ill-conceived, at least designed specifically for Team Fortress 2 they started adding promotional items from other games. Most of these items are horribly out-of-place, further degrading the work that went into the original design. Thanks to this you can now see players running round in Dragonborn helmets or with facehuggers on their heads. If I was one of the original designers I would be crying myself to sleep seeing what it has become as, despite their work, Team Fortress 2 now has all the style of a Chinese made Free to Play MMO. Believe me I know, I play one, I have even bought cosmetic items in it, but with a bland world to start with these items add colour, however gaudy. In Team Fortress 2 they are like ketchup on Lobster, covering up that beautiful flavour. Not content with this Valve have let this nonsense spread into their other games, the otherwise brilliant Portal 2 has a store where you can purchase items for the coop mode characters that don’t fit with Aperture Science at all, and this is not a free to play game but a full retail title. It is called selling out, it is when you compromise your work and what you believe in to make extra cash. I don’t think we have seen the end of it either, rather than, you know, selling the game, Valve have announced that Dota 2 will be free to play and if what has been pulled from the data files of the betais anything to go on the business model is going to be, yes, you guessed it, an item store. Forgetting the hideous mistakes that have been made with the items in Team Fortress 2, assuming that all the skins look lovely (they don’t, I have seen Orca Tidehunter, but as it is beta it is fair to say this could change) I can’t see how this can be anything other than detrimental to the game. From the 20 or so hours I have played of this brilliant game it is clear that the development team have tried to make each hero distinct and easily recognisable. This is highly important in a game where fights will last seconds and there are already 60+ heroes with more still to be added from the original mod. Any customisation, however subtle, can only undermine this making the game more confusing to play and less watchable as a spectator sport. And being a spectator sport has has been stated from the start to be one of their goals in making it. Yes, I know people buy this stuff, but contrary to popular belief the customer is not always right, there are plenty of other ways to make money if the game must be free to play, but compromising art style (and therefore gameplay) is not the right way to go about it. Please Valve, stop this nonsense, you are artists, you are a private company that does not have to answer to shareholders. You should know better.